For the majority of distance runners, the marathon distance has a steep and enjoyable learning curve, if intelligent training and equally intelligent rest are properly applied. Virtually all of the “rookie” marathon runners with whom I have worked set primary goals—in their debuts at the distance—for both health and a strong finish. I intentionally under-train first-timers, because I know the importance of simply making it to the starting line. As runners mature in the marathon distance, however, many seek that next level performance—be it a Boston Qualifier or, at a minimum, a significant bump in performance from their first few attempts at the distance. This plan looks at more advanced marathon training methods (with some tricks of the trade from the best in the world) for those looking to graduate to the full realization of your potential. In marathon preparation, how much you run matters. 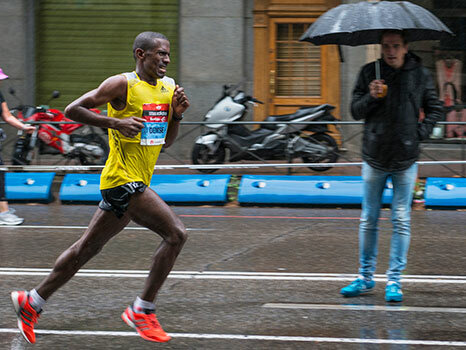 While many have attempted to sidestep the issue, no single element of training is more important to marathon performance than copious amounts of aerobic running. Increased time on feet promotes strength of connective tissue, along with capillary bed production and the delivery of oxygen to working muscles. Just how much mileage depends on previous volume and experience. 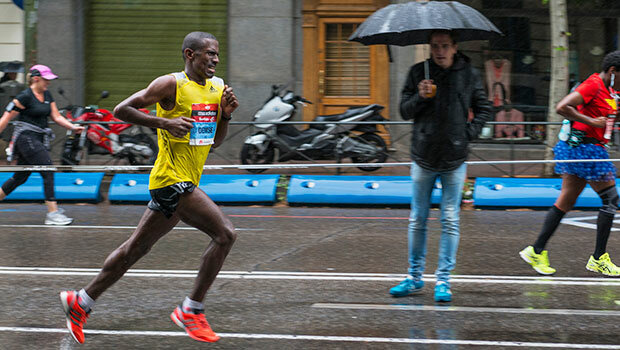 As a general rule, those looking to realize their marathon potential need be open to increasing their training volume significantly (with planned rest) in the final 12 weeks of specific marathon preparation. 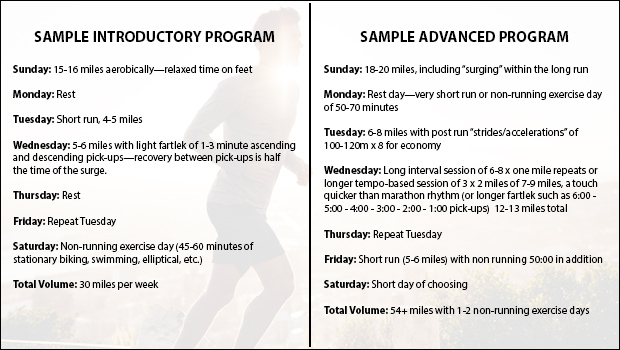 See below for a sample week from the final 12 weeks of an introductory-type marathon preparation week and one from a more advanced program. As a general rule, marathoners make the mistake of executing their long runs at a set pace from start to finish with little-to-no variation in tempo, shy of the usual slowing down—which is common even amongst veterans. Throwing in gear changes amidst your longest efforts teaches the body to run strongest at the end of the marathon and will also give you the skills to stave off bad patches, experienced by virtually all. To get started, throw in a simple one-minute surge every 9-10 minutes over the final half of your long run. These surges should not be particularly difficult. As weeks advance toward race day, you can add some longer surges.